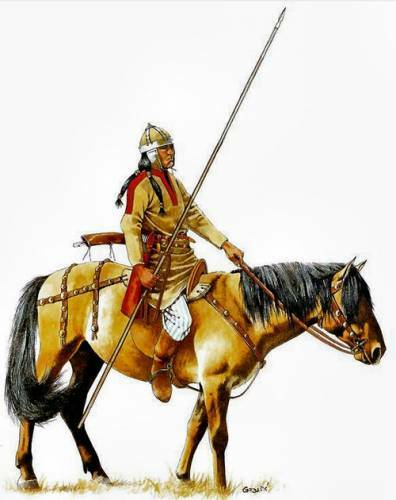 an Avar horseman, armed with a composite bow and a nomad cavalry spear (copyright: V. Vuksic). The first European mention of the Hephthalites or White Huns comes from the Byzantine chronicler Procopius, a contemporary of Emperor Justinian. Procopius recorded related comments of a Byzantine envoy to the Sassanids, who traveled to eastern Iran. The Chinese chronicles mention the Hephthalites as “Ye-ti-i-li-do” or simpler as “Ye-ta”. It seems that the Hephthalites were originally a Hunnic tribe, which was mixed deeply with the Iranians and Tocharians of central Asia, concluding as a mixed hunnic-iranian-tocharian people. This explains the possibility of adopting around 500 AD the Iranian language and several Iranian personal names. The powerful Hephthalites managed to establish two nomadic “empires” in central Asia, eastern Iran and India. In 390, their relatives, the Khionite Huns (known to the Romans as “Kidarites”) paved the way for their expansion, when they defeated the Sassanid Persians and settled in Bactria and Sogdiana (roughly modern Uzbekistan and northern Afghanistan). In 420-427 AD, the Hephthalites unleashed from their Central Asian cradle, murderous raids in Persia reaching the city of Ragai (modern Tehran), until they were defeated overwhelmingly by the Sassanids (427). But they came back and in 454 managed to defeat the Sassanids, intensifying again their raids in Iran. 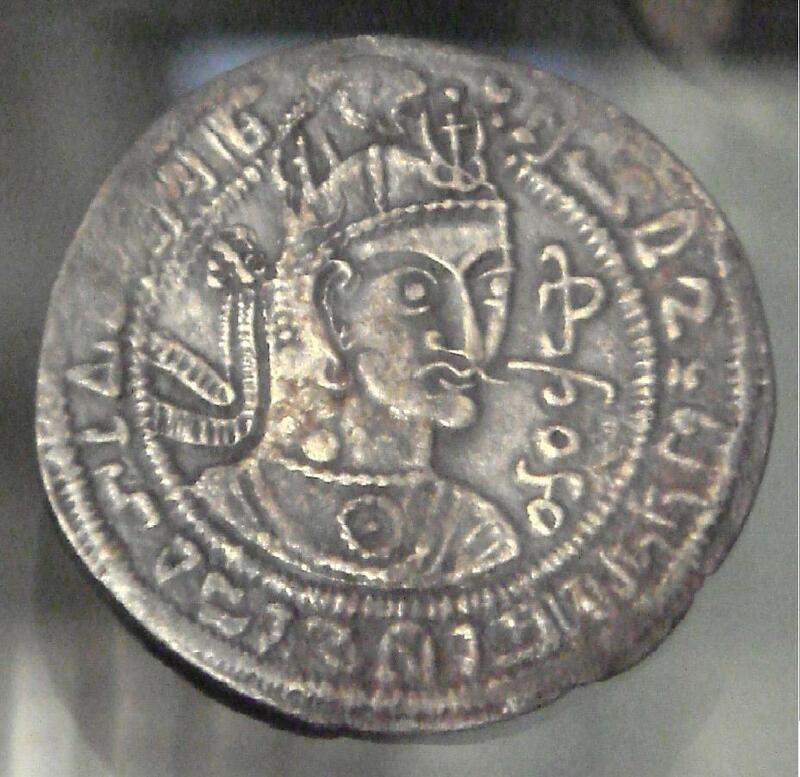 In 464, new Hephthalite raids forced the Sassanian King Phiruz to deal with them in a series of wars. The wars ended in 475 with a peace treaty, which provided for an annual payment of ransom by the Sassanids to the Hephthalites. Meanwhile, in 468 the Sassanids attacked the Khionite/Kidarite Huns slaying them en masse. The Hephthalites took advantage of the destruction of the threatening Khionites and expelled their remnants from Bactria-Sogdiana, which they annexed (473-475). Simultaneously with the wars against the Persians, the Hephthalites extended their realm to the southeast against the Kushans, a Tocharian people known to the Chinese as the Yue Chih (Yue Zhi). The Kushans had founded a powerful state extending from Central Asia to western India (modern Pakistan). In 465 the Hephthalites seized the province of Gandara (northern Pakistan) from the Kushan kingdom. Finally, in 477 they managed to destroy the Kushan empire which they annexed along with extensive Indian territories. In 479 they conquered the city-states of Κhotan and Kashgar in the modern Chinese Autonomous Region Xinjiang-Uighur. The empires of the Hephthalites, the Juan Juan and the Sassanides, AD 460-470. In 480-500 the Hephthalite invasions in the Indian Gupta empire and its destabilization due to internal factors, resulted in its dissolution. Thus the White Huns conquered almost the whole of northern and central India. Around 500, the Hephthalites of India became essentially independent from the metropolitan Hephthalite Khanate of Sogdiana. Thus were formed two Hephthalite kingdoms/empires: the Western (Bactria-Sogdiana) and the Eastern (India). In 484, king Phiruz of Persia refused to pay the annual ransom to the White Huns and he attacked them but he suffered a military disaster. After their victory, the Western Hephthalites extended their borders to the northeast, towards China, annexing modern Zungaria, Turfan and Karashar in modern Xinjiang-Uighur (493-508). In AD 500 they helped Phiruz’s successor to regain the Sassanid throne, again ensuring the collection of an annual ransom from Persia. In 503 the Sassanids launched a new bloody war against the White Huns. The two sides became exhausted and finally concluded a new peace treaty in 513. In 513 the Hephthalites reached the peak of their power. Forty kingdoms and nomadic peoples (including the Sassanid Empire) paid taxes and annual ransoms to them, while the total Hephthalite territories (Central Asian, Iranian and Indian) had a population estimated at 50,000,000-60,000,000 people (mostly Indians). Around 513 the White Huns and the Juan Juan had their first alliance contact, when a Juan Juan prince took refuge in the Hephthalite territory asking their help against a rival for the throne. 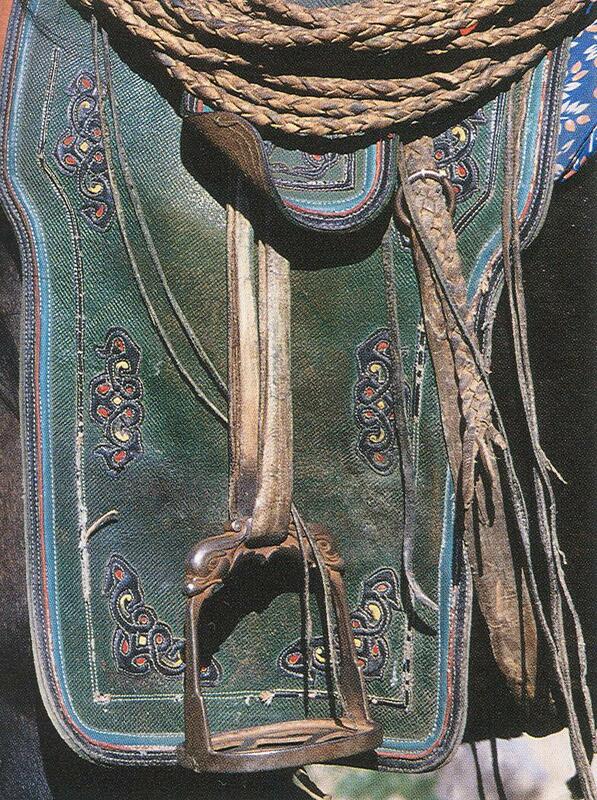 Modern stirrup from Mongolia. The stirrup was invented around AD 200 in the Asian steppes and gave a decisive military advantage to the Asian nomads, because they were riding steadily enough to fight with more flexibility. With the stirrups they managed to control their horses using only their feet, thus keeping both hands free for the use of weapons. It is usually considered that the Avars passed the use of the stirrup in Europe. In 532 the decline of the White Huns began, when they faced rebellions in eastern and central India. Gradually the Eastern Hephthalites lost most of these areas, although they managed to conquer the independent Kashmir region (maintaining it until AD 542). In 552 the Turks (Tur(u)k, Tu Jue, Tu Que) destroyed the Juan Juan Khanate and started raiding the Hephthalite territories. In 557 the Turks were allied with the Sassanids to jointly attack the Western Hephthalites and to partition their Khanate. The Sassanian king Chosroes I, had to choose between the alliance with the Hephthalites against the emerging Turks, and the reverse alliance with the later against the former. Eventually he chose to strike the White Huns considering them as a biggest threat than the distant Turks. The Western Hephthalites were defeated overwhelmingly and in 557 or 558, their main body fled galloping to northern Central Asia, in order to avoid mass extermination. Some Hephthalite sub-tribes remained in Sogdiana continuing resistance to the Persians and the Turks until 565. The Eastern Hephthalites maintained their Indian empire until 570, when it was disbanded amid revolutions. Centuries later, the Indian Rajputs were keen warriors who stubbornly resisted all invaders of India, including the British colonialists. The warlike Rajput aristocracy claimed descent from Hephthalites who were assimilated by the Indians. On the other hand, the Hephthalites were generally remembered by the Indians and the Iranians as ruthless invaders and oppressive rulers for their subjects. Currency of an Hephthalite king. Around 555, a part of the defeated Juan Juan, “30,000 tents” according to sources, fled to Central Asia galloping away from their Turk pursuers. These fugitives were most probably, already called “Avars”. 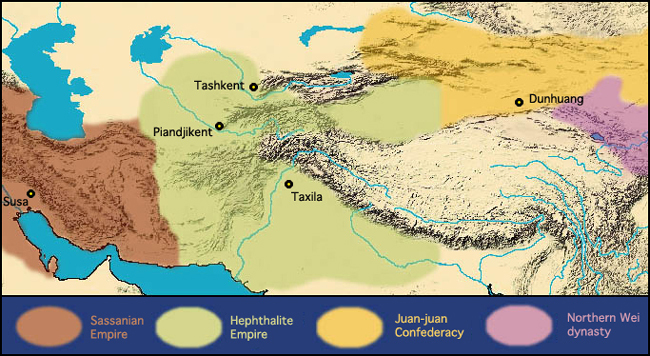 In 557/558 the Western Hephthalite survivors also escaped to Central Asia, where they met the Juan Juan /Avars. According to the most probable theory, the two peoples united against their common enemies, the Turks, forming a new nomadic confederacy. The name ‘Avars’ means the ‘exiles’ or ‘refugees’ in the proto-Turkish language, which was probably the mother tongue of most of the Avar sub-tribes. It seems that the Juan Juan royal family or a branch of it, became the royal dynasty of the Neo-Avars. The new tribal confederacy involved other tribes also, mainly Turkish (Central Asian or other refugees from the east). Earlier theories regarded the Avars of Europe to be descended from the Juan Juan exclusively or from the Hephthalites exclusively, or from other nomadic peoples (Kao-ch’e and others). (1) Moravcsik Gyula: BYZANTINO-TURCICA, 2 Band., Berlin 1958 (β΄ έκδοση). (2) HISTORY OF IRAN, Vol. 3, Cambridge University Press. (3) Enoki, Kazuo: «ON THE NATIONALITY OF THE EPHTHALITES» in Memoirs of the Research Department of the Toyo Bunko, No. 18, 1955.